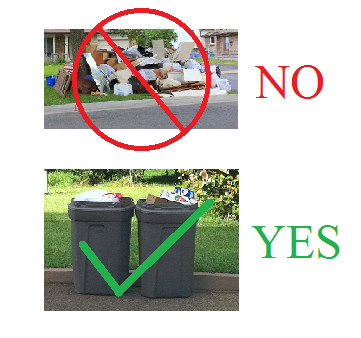 If you are moving or disposing of a large amount of trash, please do not place a large quantity at the curb – you must arrange for a dumpster or pickup at your own cost. Weekly curbside trash collection is for normal household refuse amounts. Please do not exceed four 35 gallon cans. Do not exceed 50 lbs in weight – the can must be able to be picked up by one person. A large item pickup can be pre-scheduled through the Village Office (759-3721) for pickup the first Thursday of each month, however, excessive quantities will not be accepted. Please see below for additional information on garbage and recycling. Appliances – Picked up the first Thursday of each month. Cost is $5 and stickers must be purchased at Village Office. Tires – Up to 4 tires can be picked up on Thursdays. Cost is $2 per tire and stickers must be purchased at Village Office. Large Item – Picked up the first Thursday of each month. No charge; however, the Village Office must be contacted in order to schedule the pick up prior to placement at curb. Construction Waste-Persons with over half cubic yard must arrange for their own pick up with a vendor of their choice and at their cost. Electronics – CANNOT be picked up. Special pickup is scheduled annually in August or you may make your own arrangements. 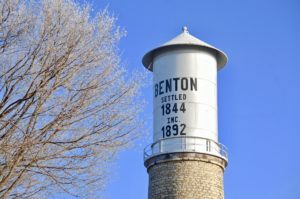 Online PaymentsSign Up for Direct Payment For Benton Municipal Utilities and Avoid Late Fees!